Short lectures will be delivered by Fr George Guiver CR and Rt Revd Dr Stephen Platten. 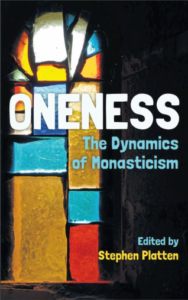 “Oneness” considers the role small-group monastic life plays within the life of the contemporary church. Using a focus on the life, practice and history of the Shepherds Law community as a starting point, the book broadens the discussion to consider how such communities negotiate the boundary between the solitary life and life within their community.